Ten-acre Pond Island, just south of the mouth of the Kennebec River, has no pond; the origin of its name is unknown. 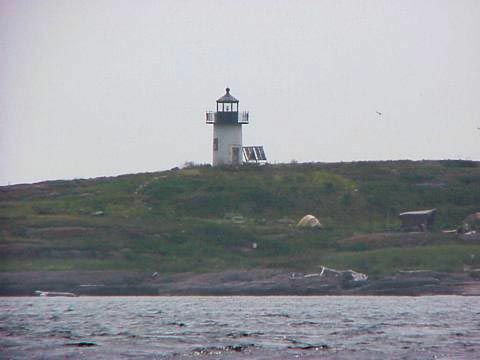 In March 1821, a quarter of a century after a lighthouse was erected in a commanding position on Seguin Island, near the mouth of the Kennebec, Congress appropriated $10,500 for three light stations, including one on Pond Island. The first small tower was accompanied by a stone dwelling for the keeper, with three rooms on the first floor and two small chambers in the attic. The station went into service on November 1, 1821. The first lighthouse was poorly built and lasted only until 1835. In March of that year, the district lighthouse superintendent advertised for proposals for the building of a new stone tower, 13 feet tall to the base of the lantern, 14 feet in diameter at the base and 10 feet at the top. The tower was topped by an octagonal iron lantern, a little over 7 feet tall. The fixed white light was 55 feet above mean high water. Spinney was still keeper when, in November 1849, the vessel Hanover, returning to Bath from Cádiz, Spain, anchored near Pond Island in a storm. As the storm raged, the captain tried to tack around Pond Island and enter the western passage into the river. The ship ran into a bar off nearby Wood Island and soon sank with all 24 crewmen on board. Only a dog survived. The present 20-foot brick tower was built and fitted with a fifth-order Fresnel lens in 1855, and a new wood-frame keeper’s dwelling was constructed and connected to the lighthouse tower by a short covered walkway. The focal plane of the fixed light was 52 feet above mean high water. An article by Henry S. Bicknell in the New England Magazine in 1886 provides a glimpse of life on Pond Island. “We were told,” Bicknell wrote, "that the island provided pasturage sufficient for one cow, but, from a close observation, it was evident that she must be content with two meals a day, or to get an occasional donation from the meadows on the mainland. Twice a year the district inspector makes his rounds, and, during the week previous to his visit, the entire family devote all their energy in scouring and polishing, until everything about the place, from the doorknob to the lenses, fairly sparkles with brilliancy. On these occasions, the light-keeper is seen in his best mood, and is the perfection of politeness and urbanity, for then a hope of reappointment is betrayed in every movement." Isaac W. Morrison, an avid fiddle player, became keeper in 1889. A young resident of nearby Popham Beach, Hiram Stevens, rowed out for lessons with the lighthouse keeper. Stevens later became a successful composer and had several pieces performed by John Philip Souza’s band. Morrison was keeper until 1903, when he suffered a stroke. After four years at nearby Seguin Light, Napoleon Bonaparte Fickett became keeper in 1926. Fickett remained keeper until 1948, when he fell ill and retired. He and his family weathered the great storm of March 3, 1947, when surf broke over the top of the lighthouse. Down the coast in the same memorable gale, the Oakey L. Alexander ran aground near Cape Elizabeth Light. In August 1960, the Coast Guard announced that the station would be automated. The fog signal was put under the remote control of the Coast Guard station at Popham Beach. The last keeper was Ronald D. Howard. All the buildings except the lighthouse tower were destroyed by the Coast Guard. The island was transferred to the U.S. Fish and Wildlife Service in 1973, and it’s managed today as part of the Maine Coastal Islands National Wildlife Refuge. Pond Island supports nesting terns, eiders, and Leach’s storm petrels. The lighthouse can be viewed distantly from Popham Beach. Closer views are available from tour boats out of Boothbay Harbor and Bath. Stay on Route 209 for 13 miles. At one point Route 209 and Popham Rd. become one. After the 13 miles Route 209 ends and Popham Road goes to the right. Take the right and stay on Popham Road. Take Popham Road to the end at Fort Popham State Historic Site. Park there. Go onto the beach and follow the beach off to the right (away from the Fort). You'll see Pond Island Light offshore.